We at TotalVision Eyecare Center in North Haven, Connecticut are confident that our optometrists can provide the eye care you need. 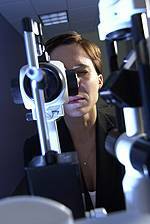 Below you’ll find a list of some of the key eye care services that our expert eye doctors practice offers. Comprehensive eye exams for adults and children, co-management of laser vision correction and cataract surgery, caring for eye emergencies and so much more. Dr Lefland provides comprehensive eye care to patients of all ages including treatment for a range of conditions including glaucoma, eye and lid infections, and dry eye. Treatment of glaucoma, eye and lid infections, monitoring diabetic retinopathy, macular degeneration, and cataracts. Dr Lefland can treat and prescribe medication for eye infections, remove a foreign body from the eye and treat other eye emergencies.